It was another successful night at Falmouth College with the Post 16 Evening, as lots of students and parents visited the school site to find out more about what could be the best options for them after their GCSEs and beyond. There were visiting representatives from partnership courses including Plymouth Argyle Football Club, Falmouth, Exeter and Bath University and the National Citizen Service. Falmouth College is celebrating being the top non-selective college in Cornwall in the Government’s AAB A level measure. 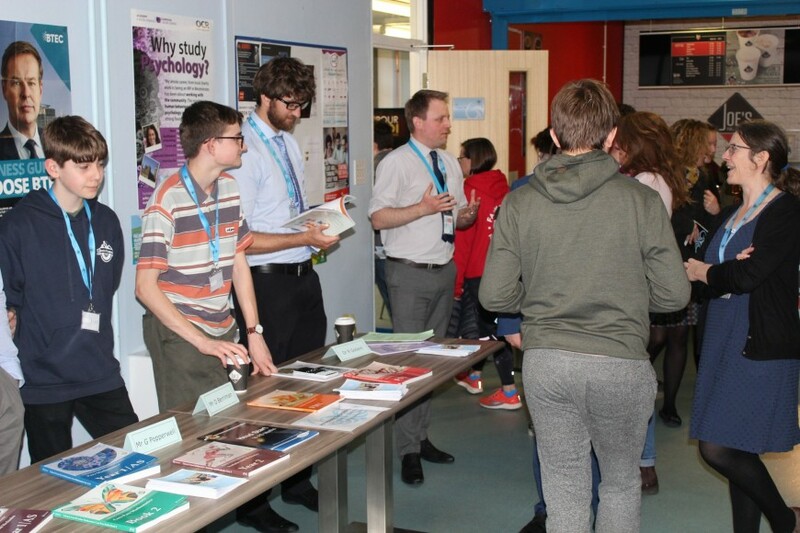 Following a welcome presentation delivered by Head of College Dr Matt Fox, visitors made their way to the college area of the school where staff and students had set up workshops and stalls in the study and common room areas, as well as elsewhere in the school. Students and parents had the opportunity to learn more about a variety of subjects and discuss options with tutors and teachers. Current Falmouth College students were also on hand to speak of their own personal experiences and future plans. There is no shortage of course options at Falmouth with something for everyone and various qualifications. Available subjects to study at Falmouth College: Applied Science, Art & Design, Biology, Childcare, Chemistry, Construction, Economics, English Language, English Literature, EPQ, Film Studies, French, Food & Nutrition, Geography, Hairdressing, Health & Social Care, History, IT, Mathematics, Further Maths, Media, Music, PE & Sport, Performance, Photography, Physics, Politics, Product Design, Psychology, Photography, Sociology and Spanish. The college is regionally and nationally high achieving, offering excellent benefits and has been named as the top school in Cornwall for various measures. These benefits include: free transport from the surrounding areas, courses run in conjunction with Falmouth University and Exeter University, Plymouth Argyle Football Club, Medical and Coding Academies, bespoke Hair Academy, small classes to ensure you get the attention you need and great results from a wide variety of courses, not to mention our fantastic new Sports Hub. To download an application form and apply, please click here.